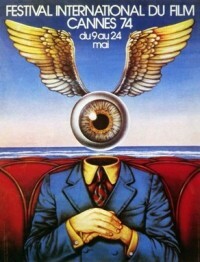 The 27th Cannes Film Festival was held from 9 to 24 May 1974. The Grand Prix du Festival International du Film went to The Conversation by Francis Ford Coppola. The festival opened with Amarcord, directed by Federico Fellini and closed with S*P*Y*S, directed by Irvin Kershner. ^ "Posters 1974". festival-cannes.fr. Archived from the original on 14 December 2014. ^ a b c "27ème Festival International du Film - Cannes". cinema-francais.fr (in French). Retrieved 4 June 2017. ^ a b c d "Official Selection 1974: All the Selection". festival-cannes.fr. Archived from the original on 26 December 2013. ^ "1974 - Toute une époque (A whole era)". cannes-fest.com (in French). Retrieved 4 June 2017. ^ "Great Cannes Openers". empireonline.com. Archived from the original on 14 December 2013. ^ "The copening films at Cannes". vodkaster.com (in French). Retrieved 25 May 2017. ^ "Juries 1974: Long film". festival-cannes.fr. Archived from the original on 4 March 2016. ^ "13e Selecion de la Semaine de la Critique - 1974". archives.semainedelacritique.com. Retrieved 19 June 2017. ^ "Quinzaine 1974". quinzaine-realisateurs.com. Retrieved 19 June 2017. ^ "FIPRESCI Awards 1974". fipresci.org. Retrieved 30 June 2017. ^ "Jury Œcuménique 1977". cannes.juryoecumenique.org. Retrieved 30 June 2017. ^ "Cannes Film Festival Awards for 1974". imdb.com. Retrieved 30 June 2017.